Enjoy a 3.5km courtesy scenic shuttle to our cave while your experienced guide reveals the rich history of Waitomo. Then, take a short walk through breath taking New Zealand native bush to the cave entrance. There, your guide lights the candles setting the scene for an intimate cave experience, where you will see glowworms up close, cave formations up close and appreciate the beauty of Footwhistle Cave (also known to local Maori as Te Anaroa Cave). The solar powered lights are kept low so you can appreciate the magnificent glow worm displays at their best, only inches away. Around a corner lie the bones of one of New Zealand's lost treasures, the ancient Moa. The soothing sound of Footwhistle cave stream flows in the darkness below. 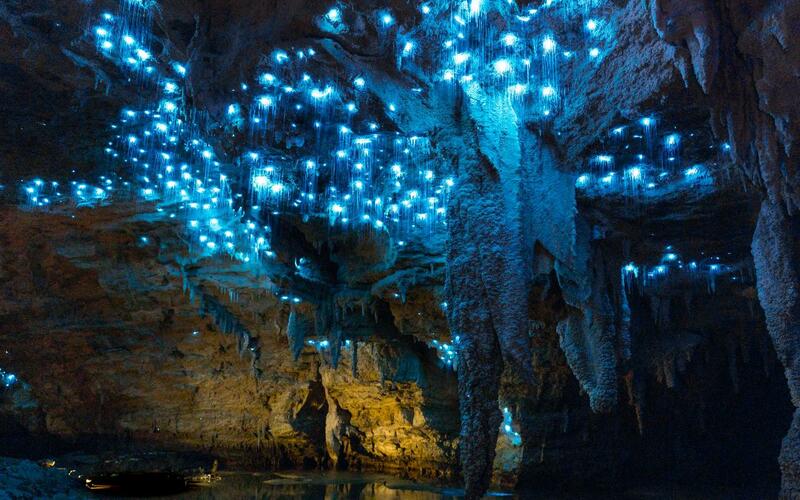 Formation lights are especially turned on to cast a warm glow over stunning cave formations. The guide tells the stories of the insect life that live here - titiwai, the glow worm, and tuna, the eel. After enjoying a relaxed stroll through the cave, you'll be seated in Footwhistle's Cathedral to see it lit up by a dazzling magnesium torch. Although the display only lasts a few seconds, your memories of the Footwhistle Cave will last a lifetime. Be sure to bring your camera as you will be able to take photos and your guide will also be able to help you out with the best camera settings to get your best holiday pic. Complete the tour by enjoying a complimentary Kawa Kawa tea whilst you relax in our ponga hut nestled in native forest and surrounds.